Looking for a sweet Easter treat without a lot of fuss? Wake up your tastebuds with these easy low FODMAP lemon poppy seed cookies! Light and fluffy, with a hint of citrus, these cookies are the perfect dessert to celebrate the arrival of spring! It finally feels like spring has reached us here in Canada! In addition to scrubbing our house from top to bottom, purging our closets, and cutting my hair, I’m craving everything lemon! These low FODMAP lemon poppy seed cookies are packed with the clean, bright flavour of fresh lemons. Trust me; these cookies will be the star of your dessert table! 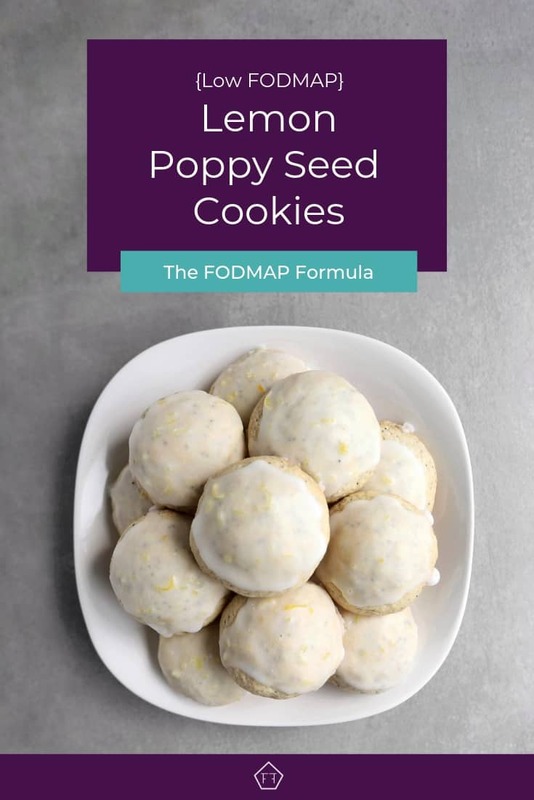 Think these low FODMAP lemon poppy seed cookies sound great, but you don’t have time to try them now? Don’t worry! You can PIN THIS POST for later. Looking for a sweet treat for your dessert table or as a tasty snack? These low FODMAP lemon poppy seed cookies will wake up your tastebuds! Check out the notes below for tips on keeping this recipe FODMAP friendly. First up, flour. If you’re in the elimination phase of the low FODMAP program, you’ll need to use gluten-free flour. For my Canadian peeps, I’m a huge fan of PC’s gluten-free all-purpose flour. We’ll also be using pure vanilla extract. According to the Monash app, vanilla extract is low FODMAP in servings of 1 tbsp (20 g) per sitting. Monash doesn’t have a maximum serving recommendation for this food. We’ll be using 1 tsp of vanilla total, which works out to 0.04 servings per cookie. This is well within the recommended range. This recipe also uses poppy seeds. Monash University has said poppy seeds are low FODMAP in servings of 2 tbsp (24 g). Our recipe uses 2 tbsp total, which works out to 0.04 servings per cookie. This is within the recommended range. We’ll also be using lemon juice and lemon zest. According to the Monash app, lemon juice is low FODMAP in servings of 0.5 cups per sitting. Servings of 3/4 cups or more are high in the FODMAP fructan. 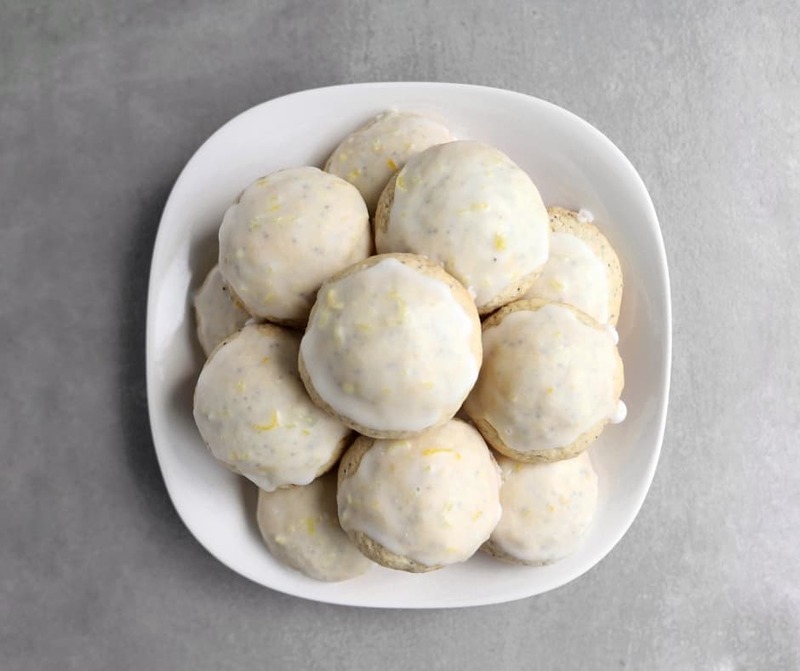 Our recipe uses 2 tbsp of lemon juice total, which works out to 0.01 servings of fructans per cookie. This is well within the recommended range. For the record, Monash hasn’t listed lemon zest on their app, specifically. However, there are currently two recipes on their blog that use lemon juice and zest in similar quantities. Finally, we’ll be using milk and butter. If you’re in the elimination phase of the program, you’ll need to use lactose-free milk. While butter technically belongs to the dairy family, according to Monash, butter doesn’t have any FODMAPs (because it’s all fat). Just remember to check the label for ingredients like milk solids, and you’re good to go. This recipe has a lot of ingredients! Wondering how they stack up? Check out the FODMAP servings below. Want to try these low FODMAP lemon poppy seed cookies? Don’t forget to PIN THIS RECIPE for later! Looking for a sweet treat this Easter? 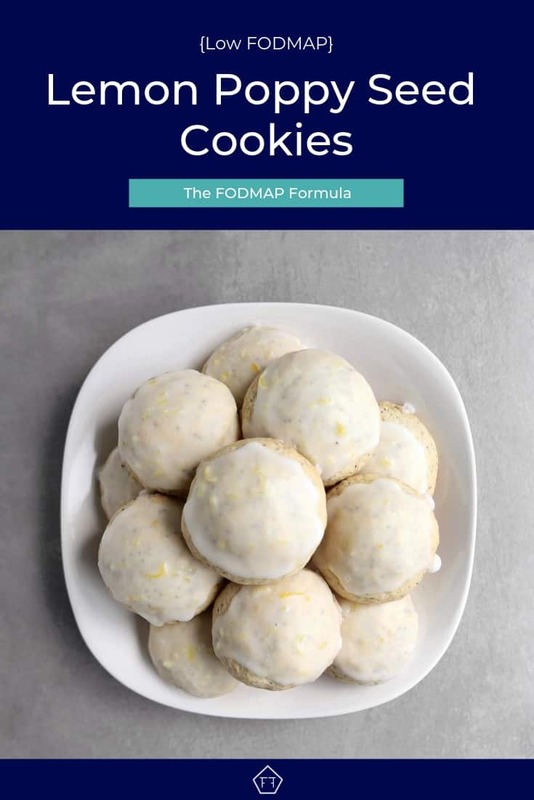 Try these light and fluffy low FODMAP lemon poppy seed cookies will be the star of your dessert table! Move your oven racks to the upper and lower thirds of your oven and preheat the oven to 350 degrees. Then, line two baking sheets with parchment paper and set them aside. Mix the flour, poppy seeds, baking soda, and salt in a medium-sized bowl and set it aside. Combine the butter and sugar in a large bowl with an electric mixer on medium-high until light and fluffy (about 4 minutes). Then, add the egg, vanilla, and 1 tbsp of lemon zest and beat until they're fully incorporated. Turn the mixer speed to low and add the flour mixture to the butter mixture, then return the mixer to medium-high until the flour is just combined. 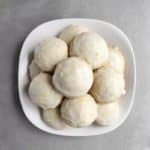 Roll the dough into 24 balls and place them on your prepared baking sheets about 2" apart. Bake the cookies for 15-20 minutes, switching the trays halfway through baking. Let the cookies cool on the baking tray for 5 minutes, then move them to a wire rack to finish cooling. To make the glaze, whisk together 1 tsp of lemon zest, the icing sugar, and just enough lemon juice to make the glaze spreadable. Spread it on or dip your cookies and allow the icing to set for at least 20 minutes before serving. I hope these low FODMAP lemon poppy seed cookies are the perfect addition to your spring! If you like this recipe, don’t forget to share it! Together we’ll get the Low FODMAP Diet down to a science! Low FODMAP Lemon Cake Looking for a light and fluffy dessert? Made with fresh lemon zest and a covered in a light buttercream frosting, this low FODMAP lemon cake will put a bounce in your step this spring! Low FODMAP Shortbread Cookies Looking for a sweet treat? These shortbread cookies are so light they’ll melt in your mouth! Low FODMAP Haystack Cookies Have a chocolate craving that just won’t quit? Packed full of chocolate, oats, and coconut, these mouth-watering cookies will make your tummy and your taste buds happy. Hi! What’s the best way to store these cookies? I normally stick them in an airtight container and leave them at room temperature for up to a week. You can also keep them in the fridge, but they’ll get a little dense. Previous post: Is Your Gluten Sensitivity Really an Intolerance to Fructans?